Objective:Despite increased utilization of laboratory, radiologic imaging, and complex scoring systems, negative appendectomy (NA) rates in children remain at 4-10% nationwide. We reviewed the clinical data of patients undergoing appendectomy to further reduce our NA rate. Design: Retrospective review of consecutive appendectomies, 2009-2011. Methods: Alvarado score and imaging data were collected for patients undergoing appendectomy for presumed appendicitis. Parameters that were absent or normal in >50% of NAs were further analyzed. Receiver operating characteristic (ROC) curves were constructed for continuous variables, using appropriate cutoff points to determine sensitivity and false-positive rates. Results: 626 appendectomies were performed during the study period, 20 (3.2%) of whom had a pathologically normal appendix. 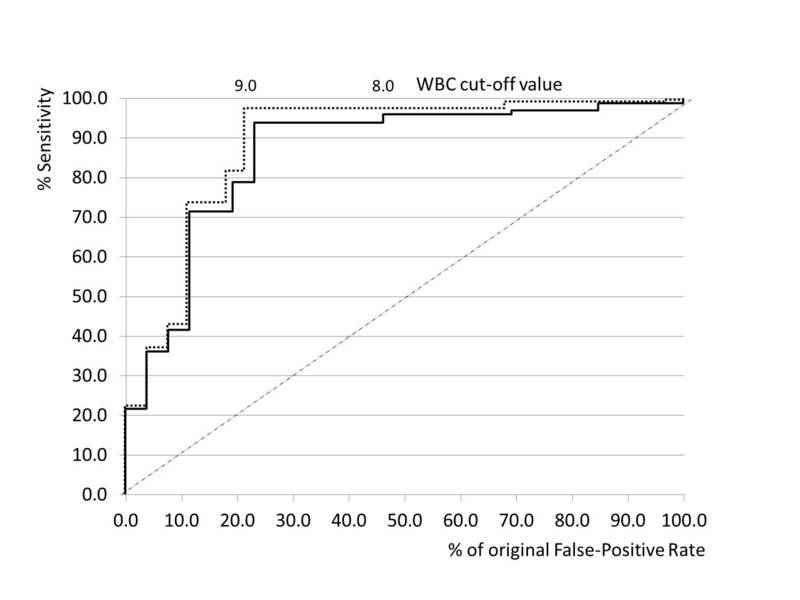 The only parameter found to be normal in >50% of NAs was white blood cell count (WBC) (85%). ROC curve indicated that using cut-offs of 9.0 and 8.0 yielded sensitivities of 96% and 98%, and reduction of NA rates by 46% and 23%, respectively. Fourteen TP had a WBC <9.0 (9 <8.0), 72% with symptom duration <1 day. Excluding these patients increased the sensitivity to 98% for both WBC cut-offs. Conclusions: Absence of an elevated WBC is a risk factor for NA. Withholding appendectomy for WBC below 9.0 and 8.0 reduces the NA rate to 1.5 and 0.8%, respectively. Missed true appendicitis in patients with normal WBC can be mitigated by an observation trial in those presenting with early symptom onset.